In what is likely to be the only piece of non-Hot Docs-related news for the next little while, I’m happy to announce that BBC America/BBC Canada this week released Seasons (or more accurately, Series) 1 and 2 of Adrian Hodges’ post-apocalyptic drama Survivors. I became hooked on this show more than a year ago, and up until now had to resort to some rather dubious means in order to keep up with it. Based on the original 70s series created by Terry Nation (although Hodges calls it more of a re-imagining), Survivors follows a small group of people who survive a catastrophic virus that wipes out 99% of the world’s population in a matter of a few days. The storyline has lots of twists and turns, but the best part for me is just seeing how people might survive when all of their creature comforts are suddenly taken away. Who is best-equipped to survive in a world like that? Since the series is based in the UK, at least everyone isn’t going around with automatic weapons, so the threat of violence, though ever-present, doesn’t erupt into ludicrous firefights every episode. I’ll have to say that the writing starts to wobble a bit in Series 2, especially when it’s obvious that the producers are reluctant to kill off any of their characters. But Survivors is hugely enjoyable, and may even have you thinking about how you might endure if/when everything eventually goes pear-shaped. 12 episodes (641 minutes), filmed in high-definition and presented in letterboxed 16:9 ratio. The original series has also been released. 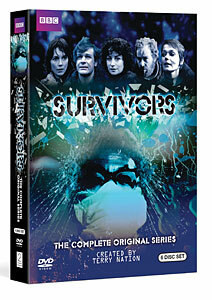 All 38 episodes from 1975-1977 are included, as well as the featurette “The Cult of Survivors“. Although the fashions haven’t aged kindly, the stories hold up remarkably well, and you can see how the newer show has changed some of the original characters. As you can see from the extensive Wikipedia entry, this series has attained cult status and for fans of the show, this is likely to be the bigger prize. 38 episodes (1878 minutes), presented in letterboxed 16:9 ratio. Bonus features include featurette “The Cult of Survivors” and photo galleries. This entry was posted in DVD Clubs, Television and tagged bbc, postapocalyptic. Bookmark the permalink.